The above-ground pool that thinks it's an in-ground swimming pool! Always your own custom deck design! Can't get an in-ground pool? You've come to the right place. Welcome to Aqua Star Pools - Home of the "All-American Deck-Pool'. Welcome to Aqua Star Mfg. 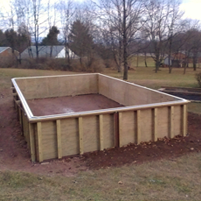 LLC, manufacturers of America’s best above ground swimming pools. 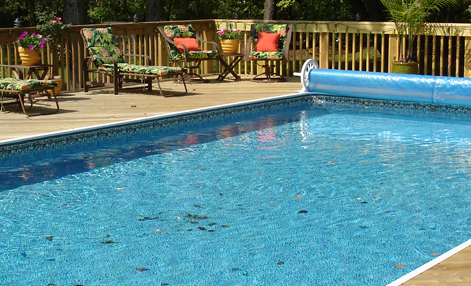 Our Deckable Pool is designed to integrate seamlessly with your new or existing wood deck and is a 1st choice of many DIY handymen or industry professionals alike. Our exclusive DR-1 extruded aluminum coping makes it possible by accepting your own standard or ‘maintenance free’ decking, so each installation is truly your custom pool design. And, as you can see, our pool is perfect as a semi in ground pools for sloped yards. 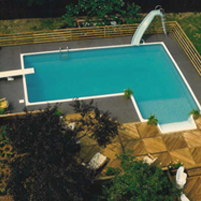 Our classic rectangular on ground pools will surely enhance your yard-scape and become an elegant architectural addition to your backyard … that can only be an Aqua Star Deck-Pool. Note: Our pools are ideally adaptable for use with a current generator to create your own ‘endless-swimming-pool’ effect. Our classic rectangular on ground pools will surely enhance your yard-scape and become an elegant architectural addition to your backyard . That can only be an Aqua Star Deck-Pool!